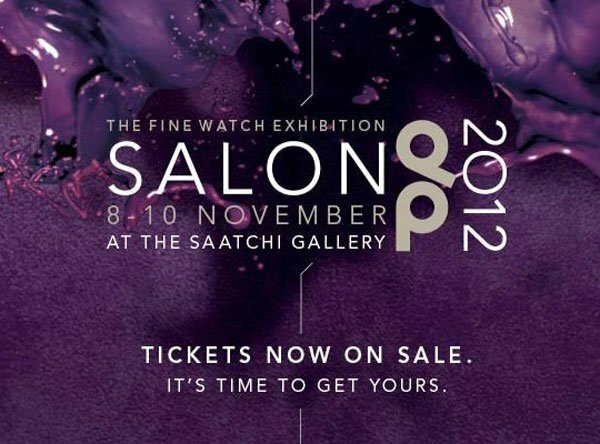 Posted on October 29, 2012 Author Chaz NashCategories Bell and Ross, Bvlgari Watches, Christophe Claret, Jaeger LeCoultre, Luxury Watches, Tag Heuer Watches, UrwerkLeave a comment on SalonQP 2012 – The UK Watch Event To Visit this Year! Martin Frei, URWERK co-founder and Chief Designer, notes that this new Urwerk’s UR-210 is “more than any other URWERK piece, the UR-210 catches the attention. The eye is inevitably drawn to the winding efficiency indicator…it’s almost a magnetic attraction. The UR-210 is not really a watch but rather a living mechanism grafted onto your wrist. 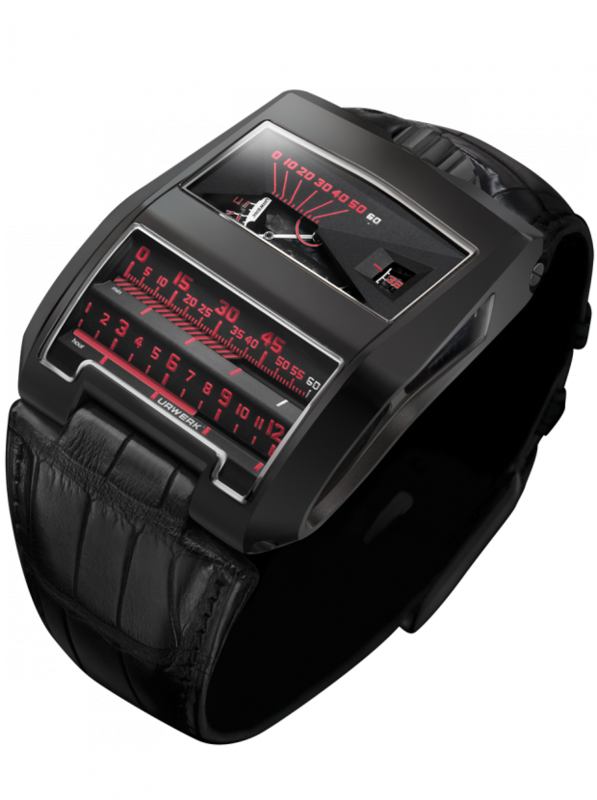 We have nicknamed the UR-210 the Maltese Falcon because we see it as the stuff that dreams are made of.” This timepiece is indeed special with its unique look and design as well as complications. 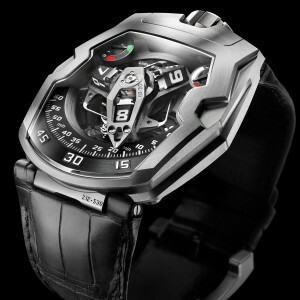 This new UR-210 is currently priced aroudn 137000 CHF. When look at the watch, one observes a traditional power reserve indication at one o’clock position. At the 11 o’clock position, simialr looking indicator can be found, which is the world-first complication that indicates winding efficiency over the last two hours. The combined information of the power reserve indicator and the winding efficiency indicator allows the wearer to know when it is time to start moving the arm or adjust the winding efficiency selector, which can be adjusted to level of activity. The indicator will point towards the red zone when the UR-210 needs to be wound and will point towards the green zone when there is enough energy. The dial of this timepiece is very eyecatching with its large, high-tech, three-dimensional retrograde minute hand which encloses the hour satellite and indicates the time as it transverses the 0-to-60 minute scale. At the 59th minute, a sharp distinct sound signals the return of the minute hand to the starting point. 3D minute hand in aluminum with brass counterweight; central cylindrical spiral in spring?steel; hour satellites in aluminium; central carrousel and screws in Titanium Grade 5. Urwerk CC1 Cobra watch has certainly earned its rightful accolade amongst the masterfully unique, insomuch as that it has joined the privileged ranks of masterpieces on exhibit at MARCUS London 10th Anniversary Exhibition. Urwerk CC1 Cobra is one bold venomous timepiece to be reckoned with, so much that it may be safe to affectionately refer to it as “King CC1 Cobra” as it reigns sovereign in existence. This watch strikes with a bold black presence and red accents that are as fierce as a cobra spitting its paralyzing venom. Reading time on this exceptionally articulate watch is an aesthetic pleasure lulling onlookers into its hypnotic movement. Yes, Urwerk’s first CC1 Cobra debuted in 2009 and it remains quite a spectacular timepiece. Its unique avant-garde arrival was absolutely stunning; however, it struck a chord of inspirational comparison to that of Patek Philippe 1958 Cobra timepiece. While the reactions to the first CC1 Cobra were astonishingly mixed, reactions to the new bold and intense majestic Urwerk CC1 Cobra for MARCUS London is by no means reserve. Urwerk CC1 Cobra for MARCUS London striking features includes a 45.7mm X 43.5mm case in 18 carat white gold with AlTiN (Titanium Aluminum Nitride) finish with Titanium base plate and sapphire crystal. It features a linear face with Urwerk Calibre UR-CC1 self-winding movement consisting of two horizontal indications exhibiting two linear display retrograde (cylinders) for jumping hours and minutes; a vertical triple-cam operating a rack, visible through a window on the side of the case, rotates the minute cylinder which is alsovvisible through the case-back, a world first. The second display is also both digital and linear. This unique watch is a limited piece of one, and of course in keeping with MARCUS unique exhibition criteria, there in essence can only be ONE. Of course if you want to experience the unique limited editions on exhibit at MARCUS London 10th Anniversary Exhibition, now running through October 2nd 2012, it requires a trip to good ole sporty London, the home of the 2012 Olympics Games. Pack your bags, grab your passport and book a flight to London to experience unique masterpieces that may only be found at MARCUS London 10th Anniversary Exhibition. Just be careful where you tread though, as you can flirt with CC1 Cobra, however, its movement and hypnotic venom may paralyze your senses and invoke your will to make both a luxurious and costly purchase well worth the investment.